CHURASA the champion performing at the finale of the eisa festival. 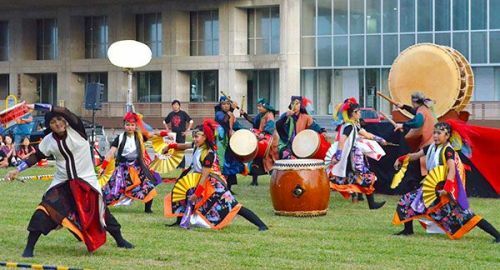 The Worldwide Eisa Festival was held at the National Theatre Okinawa in Urasoe City on November 4 and 5. Nineteen teams competed in the Grand Prix match, and CHURASA took the first prize. CHURASA. JR also won the first prize in the junior category, in which a total of ten teams competed. CHURASA JR. performed with a big drum that was donated by the parents of one of their members who passed away two years ago. The team leader Chikashi Tamaki shared his reflections; “we really wanted to bring the drum and the member’s spirit with the team to the festival. REQUIOS received the second prize, and Kazenomai followed with the third prize. Kazenomai Jr. won the second prize in the Jr. category, and Takanabe Shinkancha won the third.